Locate the card you are ready to practice and place it on your music stand. On your instrument, explore musical ideas playing the color-coded notes. Line up your cards side by side as you work through sections in each song. Are you nervous about an upcoming solo in jazz band? Do you have an audition that requires an improvised solo? Do you open the Real Book and think, "What am I supposed to play"? Do you wish you could solo on the chord changes and sound great? Wouldn't it be awesome to sound great and learn theory while you play? Have you been excited to attend an improvisation workshop only to leave totally confused? Do you avoid teaching improvisation because it takes away from rehearsal time? Rather than transposing an elaborate description of "what to play when" -- for each instrument -- over every chord, arm your students with JazzDeck™ and try the following: "Class, find the card that matches the chord above measure one and turn it over. Solo using the color-coded notes." 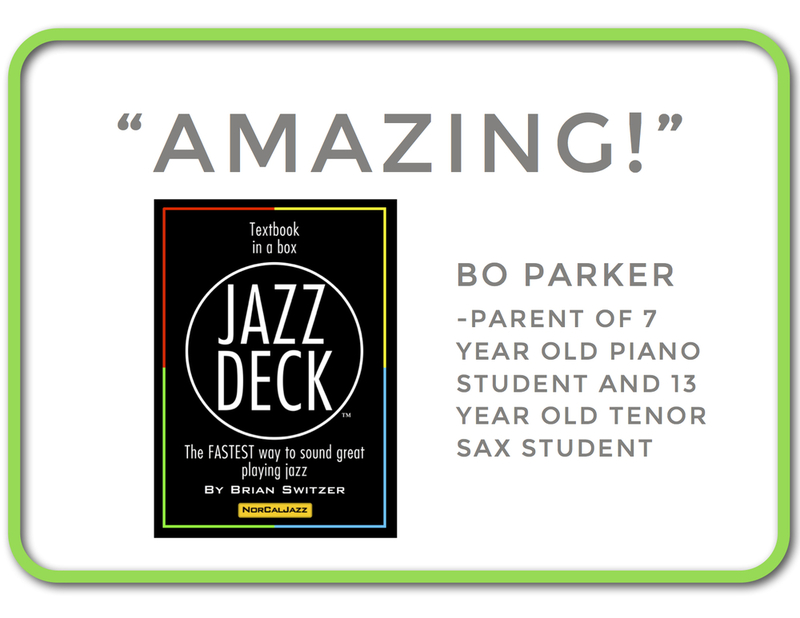 Each JazzDeck™ includes teaching cards that illustrate an approach that students can use to interpret the chord changes for themselves. Have you always wanted to play jazz but were intimidated by the chord changes? Do you have a strong foundation in classical music and have always wanted to learn how to play jazz? Are you a proficient guitar player who gave up on jazz when it came time to read music or address concepts that just aren't covered in tab? Have you purchased a number of jazz theory books and not made it past page 10 in any of them?